Practice Manager Suzie Sonnabend in the hair salon at Whitehills Wellness Spa. 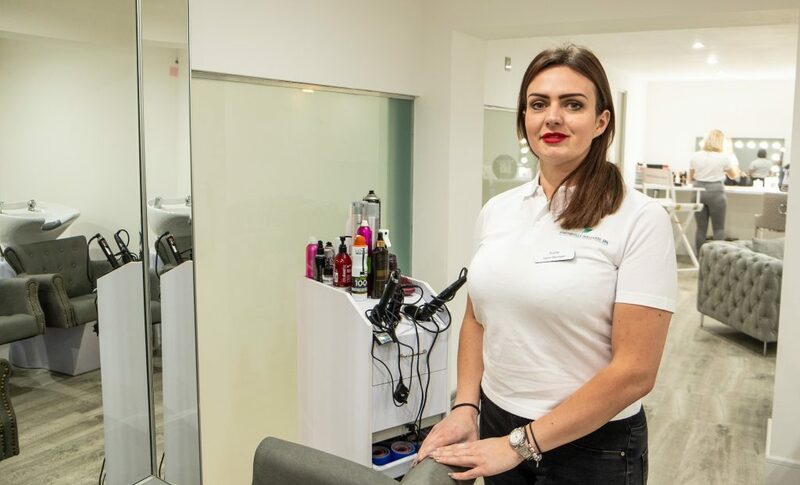 A former Royal Navy dental therapist who opened her own clinic less than three years ago has now added a dedicated wellness spa after ignoring warnings of a “logistical nightmare”. Amy Northen-Hills called on the renovation expertise of her husband and her dad to keep costs under control for the transformation of the former Colour Lounge salon in Carr Lane, Hull. She only took the keys on 10 December 2018 and, as bookings flooded in, set a deadline of Valentine’s Day for the grand opening. They made it – by the skin of their teeth! Amy, who grew up in East Hull, worked in dentistry in the Royal Navy and then in private practice, all the time saving to set up her own business. She opened Whitehills Dental Clinic in Beverley Road, Hull, in June 2015 and a year later moved to Newland Avenue after taking over a former hair salon to provide twice as much treatment space. During summer 2018 Whitehills knocked through into the adjacent premises to add skin and aesthetic treatments. An opportunity to expand into Hull city centre came when Colour Lounge closed during 2018 but Amy wasn’t tempted until she made a trip to organise her wedding last year at Rudding Park, near Harrogate. 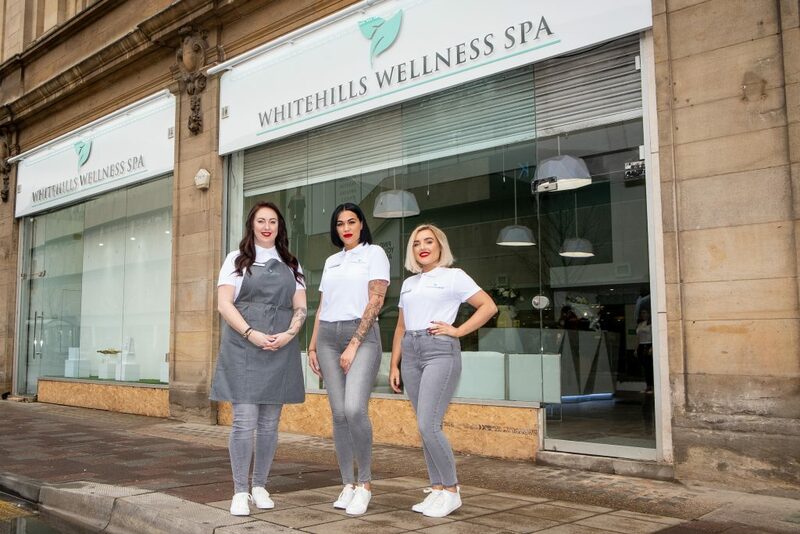 Pictured outside Whitehills Wellness Spa are (from left) Sam Coulson, Danielle Cotterell and Ruby Preston. The new centre sits underneath Hull City Hall, which dates back to the first decade of the 20th century. The first floor is fitted out as a state-of-the-art hair salon, which is a brand-new venture for Whitehills. The basement houses treatment rooms, a jacuzzi, changing rooms and a relaxation area and the ground floor accommodates the reception and a lounge where guests can book in for afternoon tea with prosecco. The investment has created eight new jobs, taking the total across both clinics to nearly 20. Future expansion plans are on hold, just as they were when Amy opened the clinic on Newland Avenue. She said: “Back in 2016 the plan was to consolidate and then look at opening another dental clinic in one of the villages around Hull. That could still be the next move but for now we’ll focus on this site and Newland Avenue. “We’ve generated a lot of interest during the two months working on the building and we put a lot of pressure on ourselves by selling £1,500 worth of vouchers during December. Clients from Newland Avenue are also eager to come here. They hadn’t seen what we were planning to do but because they are familiar with our work, they had an idea of what sort of standards to expect. Kathryn Shillito, HullBID Executive Director, said: “The transformation of the building is stunning and the business is a welcome addition to the growing ranks of high-quality, independent operators in Hull city centre. Be the first to comment on "Wellness spa a welcome addition to Hull city centre"